Vassal Gearmotors has over 70 years of experience providing low to medium power standard and custom gear motors for various industries including nuclear power, printing , chemical, marine, medical, and farming to name a few. 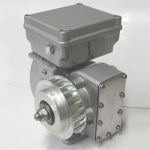 Gear motors are parallel shaft or right angle (worm and wheel) using AC or DC motors. Large range of reduction ratios offering high torque (up to 380 NM) at low speeds (down to 0.005 RPM). Vassal combines standard subassemblies or creates complete custom designs to meet the specific requirements of each customer.